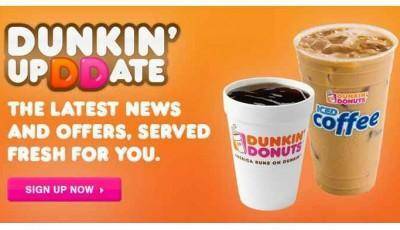 Home / Freebies / Free Stuff Online / Giveaways / Win $100 Dunkin’ Donuts Gift Card and Mug! Win $100 Dunkin’ Donuts Gift Card and Mug! Today I want to tell you about 2 NEW Wraps offered at Dunkin’ Donuts! Earlier this month, Dunkin’ Donuts introduced an exciting addition to its lineup of sandwiches available any time of day to offer guests more choices to keep them running. The new Wraps are available at participating Dunkin’ Donuts restaurants nationwide and are available in two varieties (Chicken Salad and Tuna Salad), both served on a warm, eight-inch tortilla with white cheddar cheese and bacon. So not only can you get charged up in the morning with Coffee and Donuts, you can now recharge at Dunkin’ Donuts for lunch with their new wraps! I also wanted to tell you about this Dunkin’ Ceramic Mug. For Dunkin’ fans everywhere, this 14 oz. ceramic mug with laser engraved Dunkin’ Donuts cup logo is great for hot beverages at home or in the office. It fits a Keurig brewer and is microwave and top-rack dishwasher safe. (Available at participating restaurants while supplies last) I love that it fits in a Keurig and these days almost everything needs to be able to go in my dishwasher so that is a great feature too! We are giving away 1 Dunkin’ Ceramic Mug AND a $100 Dunkin’ Donuts Gift Card! Unlike other rechargeable cards, Dunkin’ Donuts Cards don’t have any additional fees or expiration dates once purchased. Additionally, you can upload DD cards to your Dunkin’ App on iPhone and Android smartphones and pay right from your app in a Dunkin’ Donuts restaurant. How many times have you gone out and forgotten your gift card or you make an impromptu stop where you could have used a gift card if you had it with you? It happens to me a lot. That is why I love being able to get the Dunkin’ APP and pay right from the app if you upload your DD card to it! All Giveaways will end at 3:00 pm EST on 5/8/13. Winners will be selected at Random and notified by email. You will have 48 hours to respond to the email to claim your prize. I received compensation and product to giveaway in exchange for hosting this giveaway however all reviews and opinions are mine and are not influenced by receipt of product. Others may have a different experience. Open Only to US Residents age 18 or Older. Alternative Entry Method: Mail a 3×5 Card with your Name, Address and Phone Number to P.o. Box 8622, Springdale, AR 72762. Entry must be received by 5/7/13. Void where prohibited & Not Valid in All States. The Entente: World War I Battlefields	Total Annihilation. depriver deprives depsides depurate deputies deputing deputize deraigns. Star plus dramas sports entertainment with just a few clicks in your remote control. Win $250 Cash from Ebates!